On my last trip to The Loopy Ewe I met a knitter who is a friend-of-a-friend (aren't knitters great like that?) named Cathy. We had plenty of little things to chat about, and she was sweet enough to mention that she knit a Hill Top Jacket for her daughter-in-law, Caroline. There is something so perfect about a wooly gray sweater, isn't there? My favorite part of Caroline's jacket is the button band that Cathy worked sideways onto the front of the sweater. I really enjoy making up a design that can be easily customized like this for size and style. Doesn't Caroline look great? Thank you, Cathy and Caroline, for sharing your sweater with us. 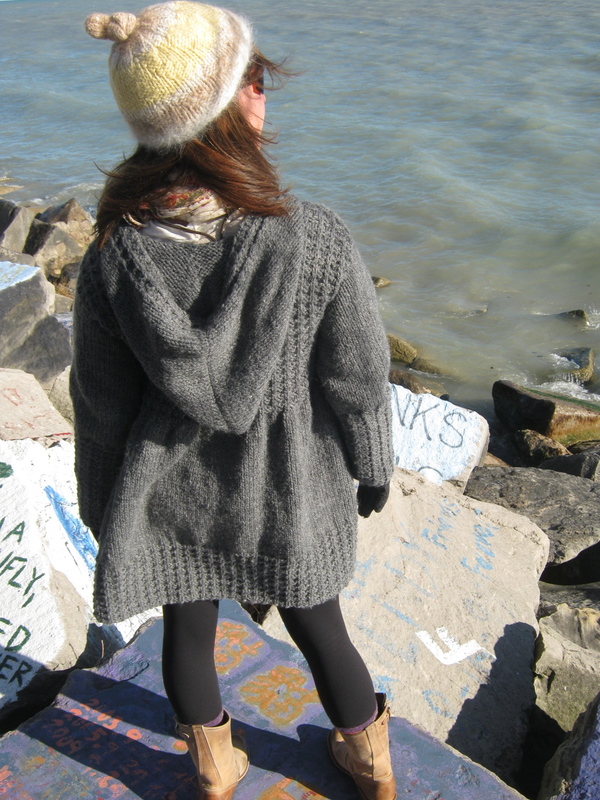 Although spring is here, I am already planning my knitting for next fall, and I now have a gray cardigan on my list!